Understanding what to use and how to soundproof tile floors is imperative to creating an effectively soundproofed room. It's necessary to use the right acoustic underlayment for tile and stone to ensure optimal noise reduction and longevity. The WhisperMat-CS underlay is specifically designed to reduce impact noise for tile and stone floors. WhisperMat-CS is constructed of a top layer of reinforced polyester mesh fabric embedded into rubberized adhesive, a middle layer of dense, cross-linked polyolefin foam sheeting for additional sound reduction properties, and a bottom layer of aggressive rubberized adhesive with an attached release liner for fast peel-and-stick installation. The WhisperMat tile underlay is easy to work with and can be cut to fit virtually any space. Soundproofing your floors with our stone and tile underlayment is a quick and effective way to create the perfect soundproof environment on even the most modest budget. Order the WhisperMat-CS now in our 3' x 40' rolls to begin your soundproofing project with the very best, most reliable soundproofing underlayment on the market. Buy now to take advantage of our great prices and fast shipping. Follow flooring manufacturer's recommended installation instructions. 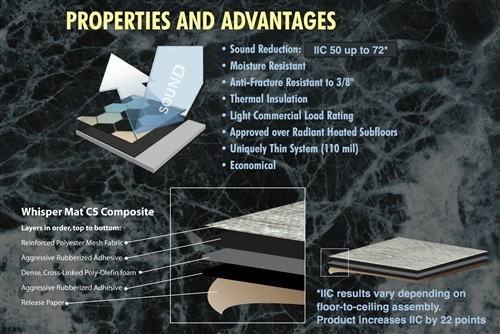 Installation and subfloor requiremenst must also conform to TCA standards. Flooring and membrane must acclimate to job site conditions before installation. Concrete subfloors must be dry, clean and free of dirt, grease, wax, paint, oil or anything that would adversely affect adhesion of the WhisperMat-CS. Subfloor must be checked for excessive moisture. If subfloor moisture/vapor is beyond 4 lb. emissions WhisperMat-CS membrane cannot be used (see "Limitations"). Leveling cements must be completely dry before membrane application. Priming subfloor: Always apply the AFM 6000 primer to the subfloor and allow to dry approximately 20-30 minutes before installing the WhisperMat-CS to ensure a good bond. Unroll WhisperMat-CS with the release liner side down. Cut the length approximately 12" longer than the distance to be covered to allow for a trimmed fit. Fold back half of the length of the roll back over the other half of the material. Score through the release liner only, taking care not to cut completely through membrane. Pull release liner away from membrane to contact the primed subfloor. Keep the release liner material close to the floor while pulling away, this will allow for a more controlled application of the membrane. Take note: there will be an immediate and aggressive bond of the membrane to the primed subfloor. Realingment of the membrane can be difficutl once adhered to the subfloor. After WhisperMat-CS is adhered, ceramic or stone tiles can be installed with a latex modified thin set meeting the ANSI 118.6 standard. Follow mortar manufacturer's recommendations for trowel size and open time. Continue to follow the TCA's instalation requirements throug the remainder of the installation. This product provided the required soundproofing needed for the job. We did have a bit of an issue as I was not advised that I needed to use the primer due to the subfloor. I called to discuss this and Soundaway went above and beyond to rectify this issue. In my opinion both the product and customer service deserve a five star rating.